Choosing a suitable and good toy has always been a challenge to most parents. Everyone wants to get a toy which can provide entertainment and learning both to their children. Such toys not only enhance the brain activity in kids but also keep them engaged for several hours. Traditionally parents used to buy building blocks for their children however the toys also got advanced with time and another best toy for kids called the activity cube was made available in the markets. The activity cube is a great way to improve a child’s learning and make them creative. The activity cubes challenge a child to get creative and improve their learning experience. They help a kid to get creative and try to solve all the problems while enjoying their toys. Many of these activity cubes have elementary details like alphabets and numbers integration in their functions which can make children familiar with them at a very early stage. These toys are created in such a way that they can keep a child busy with it for a very long time while the parents can get a break for themselves too. Baby Activity Cubes have proven to be the best toy which will help to get you a little break while your baby works on it and learn new tricks and tasks. There are several different kinds of activity cubes available in the market and each one has some unique feature in it. Therefore it gets a little tricky for parents to decide which one to pick. However, there is a mandatory criteria which should be fulfilled by an activity cube. When that criteria is fulfilled, then you can add some additional features to the cube which will give an edge to the device. Some activity cubes available in the market have features like music in it. For instance Wolvol musical activity cube has many unique features including a detachable cell phone and it also plays music. There is a steering wheel as well and also features other monitoring features. A child can play cute song compilations on the cube as well. The activity cube has a great build quality and the music it plays is also not irritating unlike other products which produce such cube that can terribly irritate a person. The functioning of the cube is based on the practical material like driving, talking, using the tools and singing too. Not only the features but the activity cube should also be safe and durable since kids are going to use them roughly too. Keeping this in mind, some are made with durable and high quality plastic and some are made of wood with excellent quality paint on it. 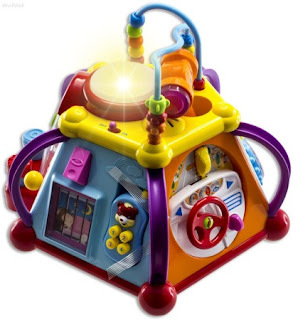 There are moving beads, abacus, shape sorter, maze, ball roller coaster, tracking panel and several other items featured on an activity cube. It all depends on the parent that which one they pick for their child to start learning. Some also feature animals and shapes which make a child familiar with them too while they are still very young.